Halloween has come early this year. It's no surprise, really -- it seems that drugstores and supermarkets have now started putting Halloween candy out simultaneous with back-to-school products! But I never expected beauty brands to get in the game. Imagine my surprise (and yes, my delight too) when I recently discovered the Halloween Sneak Preview on the Bath and Body Works website. I love that it's only September 1 and we are already supposed to be thinking about witches, ghouls, ghosts, goblins, and the best beauty products to help get us in the mood. It did give a slight throwback to my childhood, though -- what to be this year? Will I get enough candy? How late will my mom let me stay out trick-or-treating? 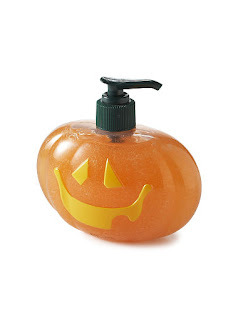 No product on the website did it better, though, than the Pumpkin Anti-Bacterial Soap in Perfect Autumn Pumpkin. One look at this baby and I knew it had to be mine! The jack-o-lantern-shaped bottle is too cute for words, and I can't wait to smell the intoxicatingly sweet aroma of pumpkin ... leading me to want to roast pumpkin seeds in the toaster oven, watch "It's The Great Pumpkin, Charlie Brown!" on TV and come up with the best costume this side of Transylvania. And at only $10 a bottle, you can bet I'll be buying a few of these for my apartment. Won't you be doing the same?